Thanks to Commisioner MIke Washo, Parks Director Bill Davis, as well as Andy and Tom Supey for granting our request to check out the Lackawanna Coal Mine Tour in McDade Park, Scranton, PA.
Ghost Soldiers was the first paranormal group to find evidence of a ghost in a mine and help him crossover. 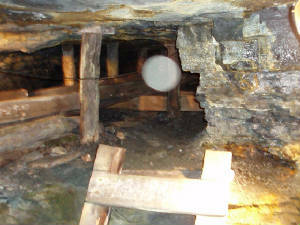 I had been to the mine and gone on the tour with my nephews, Matthew and Liam, and their dad Donald back in 2007 and had gotten two pictures with orbs in them. I was not trying to "find" anything and got these on a regular digital camera. I was intrigued by the fact that so many people died in mining accidents, that surely this mine must have seen its share of deaths. On arriving at the gift shop, I was informed by one of the women working there that "no one died in this mine." Despite that, I pressed on and after talking for a couple hours with Andy Supey, I explained that I would like to go down and investigate before committing the entire GHOSTSOLDIERS team to the mine site. After getting the proper clearances, we were given the go ahead for Wednesday at 2pm. My brother Jerry joined in to record temperature changes and we met our guide Dave, and I am sure at first he thought, Ok here we go with the "ghost busters". After explaining why we wanted to investigate the mine and help any spirit that might be trapped down there, we started down the slope and into the mine entrance. Lackawanna County's first big disaster was in 1846 in Carbondale, called "the big squeeze" because of the size of the collapse which was over 1 mile in lenght and a half mile in width!!!!!! It took the lives of 15 men and injured many others. The mine superintedent, a Mr. Bryden, rushed in while others rushed out and despite the roof still falling around him, grabbed Hugh Fitzpatrick, who had been thrown violently against the cars by the force of the collpase. Then he went back in and crawling thru a small crawlspace reached 18 men who were trapped by the rubble including his own son. Then he quickly showed them the way out and continued on toward some moaning he could hear. The miners had told him they left a man behing them who was injured. He found Dennis Farrel, alive but badly injured by a large piece of the roof. He then dragged him to safety and went back again. One man was found alive after two days of wandering around in the dark. John Hosie, came out with torn clothes and bleeding hands but alive thanks to Alexander Bryden, the mine superintendent who found him and never gave up. Unfortunately, only 6 of the bodies were recovered of the 13 still trapped below. There is a marker in a cemetery in Carbondale somewhere. It has 13 stones arranged around it, but no mention of the mine collapse. Once underground I went to work placing a couple digital audio recorders in a remote location in the mine. As I was doing this we had a focus trigger indicating that someone might be following us. I stop and ask questions, and as I asked questions, I left long silences between them. When I played these back, you can hear definite answers and even Dave was a little surprised when the answer to "Do you want us to leave?" was a very loud distorted "YES". We moved on to the end of the mine and passed through the modern day air-lock where the "nipper" sits and Dave pulled his chucky trick on us when the second door closed...very funny Dave! Anyway, I had a feeling we had to go and ask questions at the place where I had gotten a very larg orb, so we did. It was at this place where when you turn out all the lights it is the darkes pitch black that you have ever imagined. When the lights came back on, we asked more questions and it was our friend Robby who answered them, however he made it very clear he needed help. I knew right then in my heart that this was a trapped miner and he wanted out. i vowed to return the entire team and mount a spiritual rescue operation, I had already started digging. The last stop was at the "BOSSES" office. This was the guy who was responsible for everyone down here. I am not sure if this is Robby answering or someone else, maybe a boss who loved this job and comes back to visit, but when I asked if I could get a job, you hear a definite "YEP". I was able to find some reference material including an original copy of what was called "The report of the mines for the year 1916. It shows that over 1,523 miners died, of that 565 were from the Anthracite region. An additional 2,000 were severly injured. But the worst year for deaths was in 1907 when there were 3,000 deaths that year, including 361 in Monangah West VIrginia in an explosion. This resulted in the creation of the US bureau of Mines to establish safety regulations. In december of 1907 alone, 700 miners died in explosions when trapped methane gas was released and the torch on their helmets was at the right height to ignite it.